This healthy mashed cauliflower recipe is perfect for weight watchers too. Perfect potato alternative. Best of all, the kids will not notice the difference with this creamy cauliflower puree. 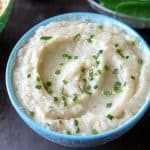 Made in just five minutes in the Instant pot, then blended to perfection and serve easily as a Vitamix cauliflower mash. This garlic mashed cauliflower is not only perfect for special occasions but great all year round. Here’s How To Make Mashed Cauliflower Instant Pot? Gather the ingredients, then cut the florets from the head of the cauliflower. Wash and pat dry the cauliflower. 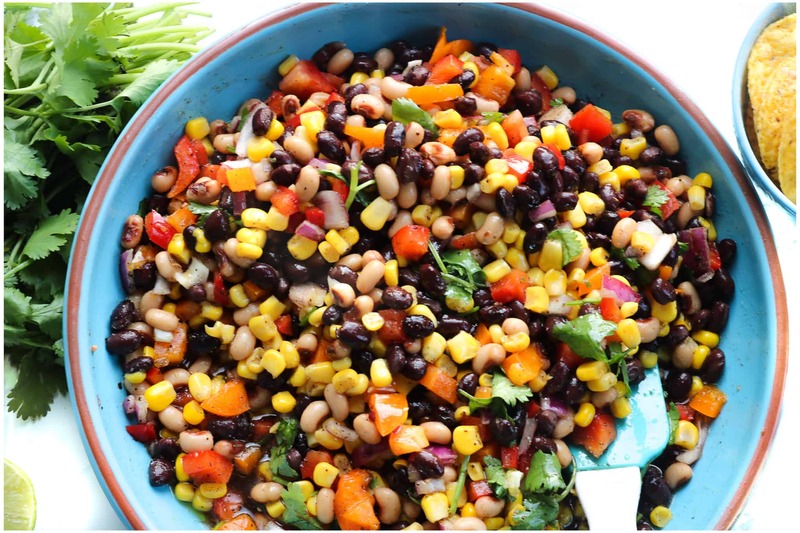 Place in a bowl and set aside. Sautéed the garlic in olive oil until fragrant. Pictures 2-3. Add in the cauliflower florets and water. Cook for 5 minutes. 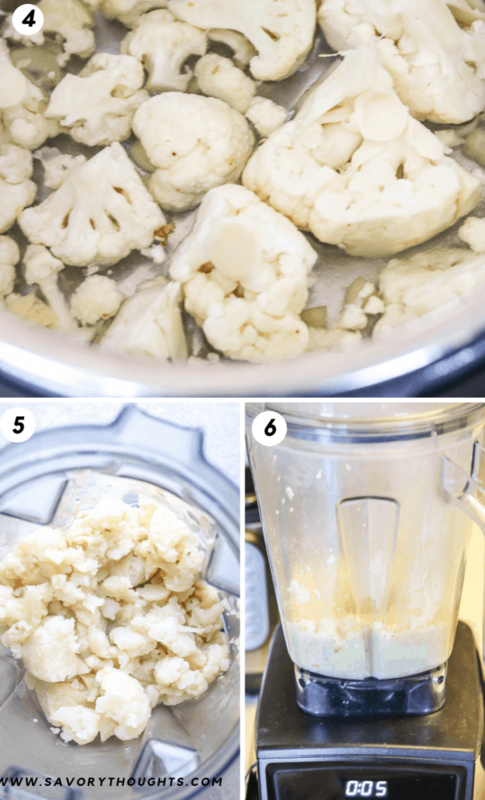 Quick release, add the cauliflower along with the water and garlic, salt and pepper in a blender or food processor. Mash or puree until desired consistency is reached. Pictures 5-6. When blending, if you desired, feel free to add sour cream for extra creaminess – totally optional. Pour mash cauliflower puree into a serving bowl, garnish with chives and serve warm. Did you make this Instant Pot Cauliflower recipe? Tag me on Instagram or Facebook and please give it a star rating below! SAVE THIS CAULIFLOWER MASHED POTATOES RECIPE TO YOUR PINTEREST BOARDS! 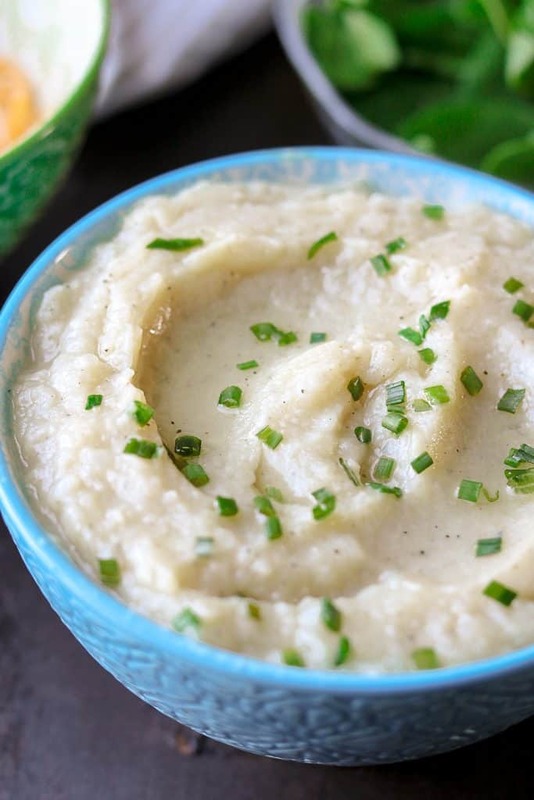 This Mashed Cauliflower Instant Pot Recipe is epic! Made with sautéed garlic. Easy low carb side dish! Creamy and scrumptious gluten-free Instant Pot Cauliflower. Quick and extremely tasty low carb cauliflower mash side dish that pairs great with protein. Separate the florets from the cauliflower head. Rinse and set aside. In the Instant Pot (IP), click on the saute setting. Adjust the time to 2 minutes. Add the oil and garlic. Cook until fragrant or lightly brown. Add the cauliflower and the water. Cover with lid and turn the valve to sealing. Manual cook on high for 5 minutes. Once done, quick release and open remove the lid. At this point, you may want to use an immersion blender, food processor, or a good quality blender to mash or puree the cauliflower. I used a blender to complete this process. Season with salt and pepper and mash or puree until the desired consistency is reached. Optional: To make it extra creamy, feel free to add sour cream when blending. What kind of stock to use to make cauliflower puree? 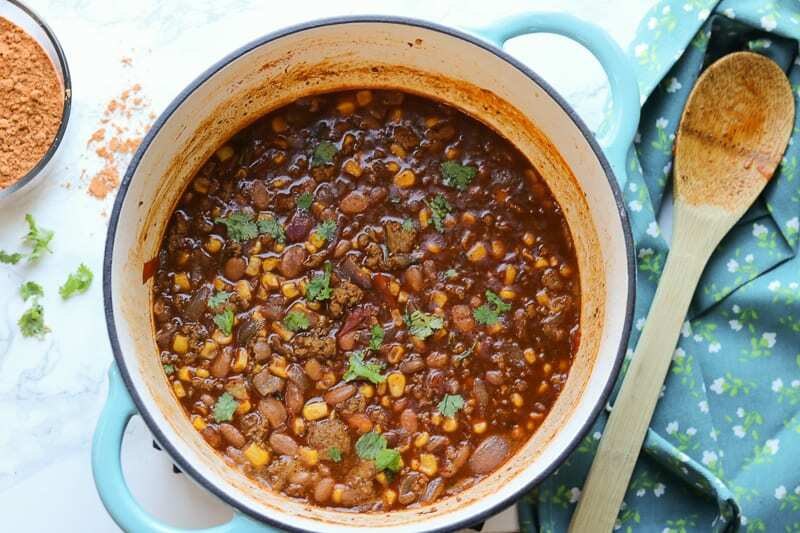 You can use beef, chicken, or vegetable. 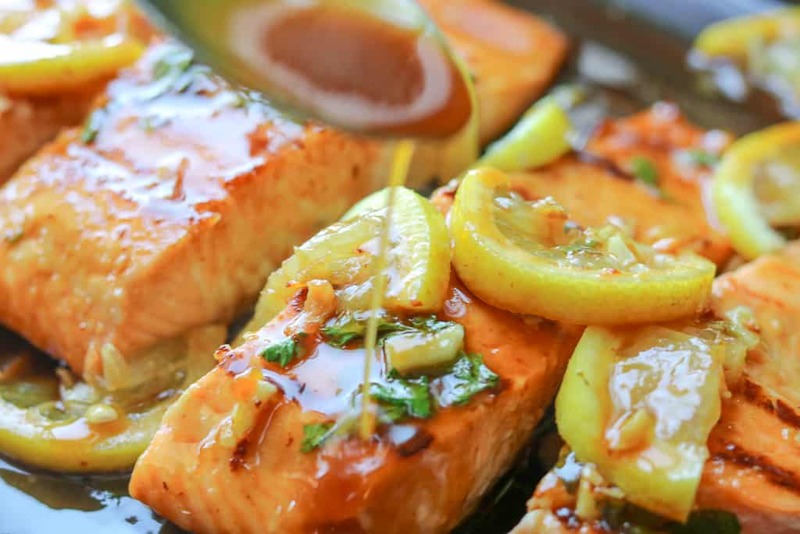 water is also great too as I have used to make this recipe. Can you use sour cream to make pressure cooker cauliflower mash? Yes. However, be mindful of the amount of liquid you add as you do not want the mash to be too thin. Can you eat leftover cauliflower mash? Yup! The cauliflower puree can last up to 3 days in the refrigerator. 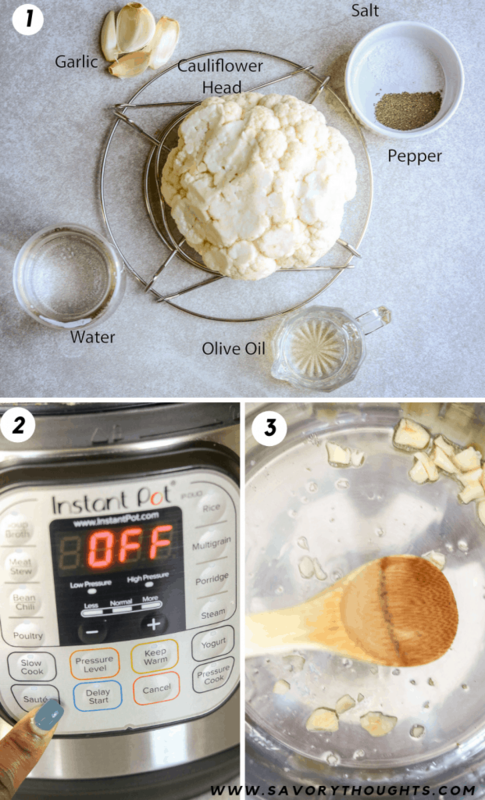 I love mashed cauliflower so I can’t wait to try your extra creamy Instant Pot version!